Professor Richard Feinman is a biochemist who came late to nutrition. He was shocked by the poor quality of the science he found there. HIUK asked him about the background to his paper summarised in another post published here today – Twelve reasons why diabetes charities should ditch the low fat diet. It calls for a major U-turn on the diet diabetics are advised to follow. HIUK/ You have been a consistent advocate of the low-carbohydrate diet which is the major challenge to orthodox dietary advice. How did you get involved? Presumably you once believed the mainstream view. What changed? So, I used low-carbohydrate diets as a unifying principle. The theory behind such diets is that carbohydrate is the major stimulus for secretion of insulin. Insulin is a kind of global hormone. It is primarily anabolic, that is, a building-up hormone, stores fat and glycogen and increases protein synthesis. In this way insulin controls most aspects of metabolism and is a good unifying thread in teaching and, practically, it bears on obesity and diabetes which is of obvious importance in medical school. I didn’t think of this as particularly controversial, so when I became involved in in research I was surprised to find that, not only was it not mainstream, but much of the nutrition and medical community was totally opposed to it. Instead they mounted a rabid defense of low-fat and calorie-lowering diets, while portraying fat as a risk factor for cardiovascular disease (CVD). Now I had worked in blood coagulation which is related to cardiovascular disease but the science is very specialized so I had not really paid much attention to the so-called diet-heart hypothesis – the idea that fat, particularly saturated fat, raises cholesterol which, in turn, causes heart disease. I was suspicious of such an idea because biology tends to run on hormones and enzymes, that is, control mechanisms, not on mass action (the idea that chemical processes run on how much stuff you put into them). However I hadn’t questioned the hypothesis very deeply. But when I began to look at the evidence, I had a great surprise. If the field is not totally bogus, it is pretty close. HIUK/ What did you do? How did your colleagues respond? RF/ I just wrote what I knew. My immediate colleagues were supportive but did not have a great interest in the subject. In the scientific world, I naturally sought out researchers working on low carbohydrate diets but apart from them scientists in nutrition and in medicine were actually quite hostile, sometimes in person. Our first paper in this field was rejected with incredibly dumb reviewer comments. I am still astounded more than insulted that, several years ago, the session chair at a medical conference, shouted me down for asking, to an audible gasp from the audience, why we keep recommending low cholesterol given its limited effect on plasma cholesterol. Because your body makes cholesterol, it is hard to regulate levels solely by intake. The problem is that the panels which make health recommendations and the “usual suspects” who speak at every conference do not represent everybody’s thinking. Many physicians use low-carbohydrate diets to treat obesity and especially diabetes but are unlikely to have the time to fight with the American Diabetes Association, even if they wanted to. HIUK/ Do you treat patients and if so how do they respond? Do some do better on low fat others on low carb? RF/ I am not a health-care provider but many people do send me emails and the like. 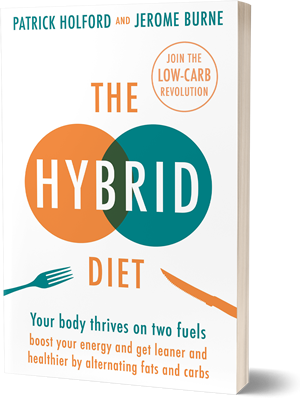 Naturally, those who have success with low-carb diets – especially if they’ve not benefited from following the low fat food pyramid – are the ones most likely to contact me, so I can’t say if it is the best diet for everybody. But a very large number do well with it and the big failure of the medical establishment is in not offering it seriously as one of the options. Low-carbohydrate diets are primarily therapeutic. We describe it as the “default” diet for diabetes and metabolic syndrome, the one to try first. I personally don’t think that there is a best diet for everybody. Evolution favored adaptability. At least half of the population may be obese or overweight but that means that even with all of the advertising and carbohydrates ubiquitous presence, almost half are not overweight or obese. Many people do fine with a high carbohydrate intake. As the Pope says, who am I to say no? HIUK/ So why is the nutritional establishment so firmly wedded to the low fat diet? Is it simply commercial interest plus professional inertia? How accurate is the reporting of low fat research? RF/ I worked in protein chemistry and blood coagulation at the (U.S.) National Heart, Lung and Blood Institute for 18 or 19 years. The Institute didn’t fund all my grants and some decisions involved more politics than science but that’s normal – science is a human activity. However people in general did try to acknowledge their own prejudices and the system largely ran on merit. The difference when I got into nutrition was shocking; the standards of the entrenched establishment were far removed from serious science. I don’t know what the motivations are. People say it is drug money but I am inclined toward psychological explanations: group think and refusal to admit mistakes. There is a fundamental problem with the way nutritional research is carried out and reported. Both medical journals and the media continue to report group statistics and percentages and relative risk. But nobody loses and average amount of weight. We need to be told how many people lost weight on each diet and how much. Similarly, knowing there was a 30 % decrease in mortality (relative risk) is not much help if it turns out that only 10 vs 13 out of 1000 people died (absolute risk). Combine this with a lack of basic common sense and the result is that we are not getting good information. For instance, a paper in the New England Journal of Medicine will report a 30 % decline in heart disease on a Mediterranean Diet but when you look at the absolute differences between the diets studied it is about 2 % and since the specific details of what the diets involved and how they were recorded are often missing, we don’t really learn anything at all. Everybody knows that reporting relative risk is not informative but they keep doing it. If you want to double your chances of winning the lottery, I suggest you buy two tickets instead of one. It is impossible to tell if the frequent reports of failures and errors in the current advice – that there never really was any evidence that saturated fat is bad; that diabetes drugs have a growing catalogue of serious side effects- will translate into any real change. The fact that the low carb diet is a serious alternative to the drugs must be a factor. To make change happen we need authoritative guidance. We need high level hearings in which all the players are in the room. It is likely that only Congress has the scope and nominal disinterest in carrying this out but I am afraid that I agree with Mark Twain that there is no organization so despicable that it doesn’t have some saving grace, with the possible exception of the United States Congress. RF/ I think that there will be some real progress. We chose those features of carbohydrate restriction that are the least controversial for our review: nothing is as effective as carbohydrate restriction for reducing high blood glucose the major diagnostic feature and cause of symptoms and there is a reliable reduction in medication. Nothing is better than low-carb for weight loss but the real plus is that you don’t have to lose weight to see the benefit in blood glucose control and cardiovascular risk factors. This is a real plus in that is hard to lose weight for many people on any diet. We specifically made it clear that the burden of proof is on anybody who wants to go against such obvious data. There is already a certain amount of what I call “slouching toward low-carb.” The most recent long-winded recommendations from the American Diabetes Association emphasized “individualization” although there were no indications of what different individuals are supposed to do. While it is really no recommendation at all, it is a step up from recommending high carbohydrate. Despite the dogged resistance of most of the medical journals, the message will get out — we are most grateful to the editor of Nutrition for giving our paper a fair shake. So, the individual dieter and diabetes patient will have access to a lot of information. Overall, as in the movie “Charlie Wilson’s War,” we’ll see.